Highly nutritious, full of antioxidants as well as iron and calcium, spinach is a favorite in my kitchen, especially thanks to its versatility to be served cooked or fresh. These Skillet Eggs were a favorite dish during my Whole 30 challenge. As a child, I don’t know that we ever ate spinach. My parents were the kind sort that didn’t serve us creepy foods like liver, oatmeal, squash, or spinach. Those foods haunted their childhoods so they didn’t eat them nor did they ask us to. In recent years, however, I’ve come to know and love oatmeal, squash, and spinach. You can have the liver. Spinach is a close friend of mine, now. It’s highly nutritious, full of antioxidants as well as iron and calcium. And its versatility to be served cooked or fresh makes it a favorite in my kitchen. It’s also one of the Dirty Dozen, foods that retain residual pesticides, so it’s better to eat organic spinach whenever possible. Frozen spinach is a great staple. Somewhere in my teen years our family was introduced to the ever-famous spinach dip in a bread bowl, typically made with frozen spinach. Love that dip! I since created a Healthier Spinach Dip that avoids boxed soup mixes and other processed ingredients. Frozen spinach is a great staple to keep on hand. Typically, frozen vegetables are a nice alternative to fresh, especially in the winter months, and are generally considered more nutritious than their canned counterparts. Frozen boxes of chopped spinach also go on sale fairly often, making it something easy to stock up on. Trader Joe’s, and perhaps other stores, also sells frozen bags of “loose” spinach, meaning you don’t have to thaw the entire package to use some. I love this for adding to scrambled eggs. I imagine it would be good in smoothies, too. Since the spinach that is sold as frozen has already been cooked it will obviously have a different texture than fresh. It works well in casseroles, egg bakes, and dips. However, I prefer using fresh spinach for a lot of other things, stirring into a meatball mixture, sauteeing with other greens, or serving in a salad. Even though, I’m often cooking the spinach, I can control how cooked it gets and avoid that sogginess that comes with overcooking. Wilted is nice. Hubs was actually the first to introduce me to fresh spinach. We were dating and he made these fantastic chicken tacos with spinach and whole wheat tortillas. He was super healthy back then. I corrupted him; convinced him that butter was good for him. Took him to France and gave him a croissant. And the rest, they say, is history. I’m the one trying to feed him spinach, now. Since joining our produce co-op, I’ve become familiar with a new breed of spinach: unwashed and unbagged. Who knew, eh? Previously, I had bought bagged and triple-washed baby spinach during the winter months when other salad greens were more expensive and not very pretty. Now, we regularly get big handfuls of large leafed spinach in our box. I store the spinach leaves in a covered plastic container in the fridge and typically wash it up shortly before serving. Since spinach grows in sandy, gritty soil, the harvested leaves can be pretty dirty. It’s best to wash the leaves in a bowl full of cool water, swishing them in the water to loosen any grit. Rinse and repeat until the leaves are clean. 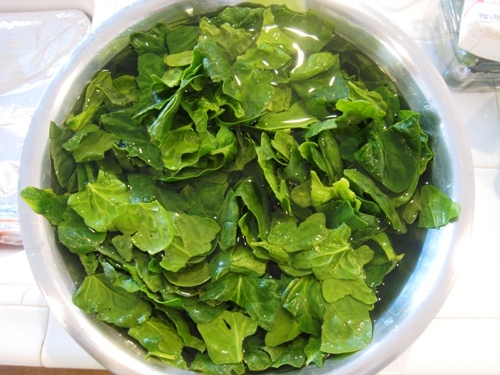 You can certainly wash the spinach ahead of time, run it through a salad spinner and store it in the refrigerator until ready to use. It tends to be hardier than other salad greens and can hold up better. Just make sure it’s not too wet when you store it. Browsing a recent issue of Bon Appetit, I stumbled on this recipe for Skillet-Baked Eggs with Spinach that sounded intriguing. But, it wasn’t until Shaina told me about her eggs on brussels sprouts that I considered actually adding eggs to my veg. I didn’t have brussels sprouts or bacon, but I did have leeks, spinach, and pea tendrils. I’ll tell you more about the pea tendrils next week, but let me say now that they are awesome! Anyway, this egg dish is super easy to prepare — and delicious. Adventuresome FishBoy14 and I enjoyed it three times last week. Three times! Get More Good Stuff: This recipe is one of the few blog recipes republished in my cookbook, Good Cheap Eats. If you like this, check out the book and see what other tasty morsels I’ve included. Your purchase supports this site. Thanks! The last time I made it with just spinach and leeks and we both felt it was missing something without the pea tendrils. But, it’s still a healthy and tasty breakfast, lunch, or dinner. It’s a very simple recipe, you don’t need to measure exactly, but you can if you want. 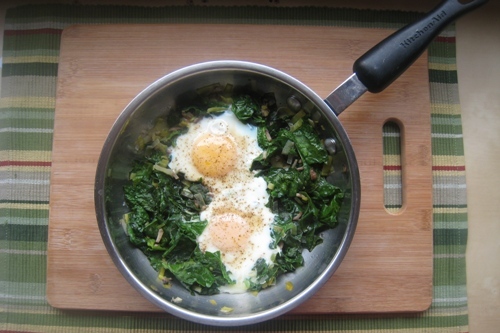 Eggs cooked on a bed of spinach with aromatic leeks are a great way to start the day. Serve these skillet eggs for breakfast, lunch, or dinner. 1. Melt the butter or heat the oil in a small skillet. Add the leek and saute until tender, about 3 to 5 minutes. 2. Add the spinach and pea tendrils. Stir gently and cook until slightly wilted. Season to taste with salt and pepper. 3. Move the mixture in the pan to create two small wells. Crack an egg into each well. Add salt and pepper as desired and cover until desired doneness, 3 to 6 minutes. Not only is spinach good for you (just ask Popeye), but it’s also delicious! Don’t be scared. There are lots of ways to prepare it! Stir it into soups, pasta dishes, meatball or meatloaf mixture, or casseroles. Toss it in salads. Tuck it in sandwiches and paninis. Scramble it with eggs. Saute it with other greens and a bit of cream. What’s your favorite way to enjoy spinach? Are pea tendrils the same as pea shoots? I can get both those and spinach local year round, believe it or not, but I get frustrated with the shoots because they don’t well. They’d be great with eggs! @BethB, I would guess that they might be called that. They are the thinnings, I assume, of pea plants. Just wash and roughly chop stem, leaves, and flowers. We’ve been eating them fresh as well as sauteed. So good! Mixed in a garden salad. I love spinach raw – but can not stand it cooked – am I weird, or what? @Carol @arewethereyet, I don’t think you’re weird at all. I have only started to cook it in the last year. With trial and error, we’re finding ways that we like it. I think it’s bizarre how I’ll be thinking of certain food issues and then within a day or week, you seem to have a post on it. I was just telling my friend how I have all of this frozen spinach that I thought I’d use but haven’t used it mostly because I don’t have many ideas of how to do so. I just printed several of these recipes and look forward to using them. Thank you! @Stacy, funny how that works! We eat a lot of spinach, first because we were part of a CSA and now because we love it and buy it organic from Trader Joe’s or Whole Foods. However, several of us in my family often find that fresh, raw spinach seems to leave our teeth feeling “squeaky.” It’s like there’s a film the spinach leaves in your mouth. It’s not gritty, as if the spinach hasn’t been washed well; it’s more like when you have a Coke and the sugar coats your teeth. Have you noticed this problem at all? Do you have any secret solution? Until I find a solution, I’ll just keep on eating spinach and ignoring the funny feeling on my teeth! @Elizabeth, I think different kinds have that quality, esp the baby kind. We’ve been getting savoy spinach and it doesn’t do that. @Jessica, Oh Thanks, I didn’t realize that! Mystery solved! I’m writing about the liver you left out! I was taught to soak the liver in milk for a while ( I usually soak it an hour or so, I was taught that this got rid of any uric acid in the meat, don’t know as my grandma taught me and she was married in the 1800’s , so I’m no young chick, LOL. But this way has been around over a hundred years that I know of and we all lived a good long life. ), I do make up powdered milk for this. Then I dredge it in flour( salt and pepper to you liking) and cook in a frying pan, so that it is just cooked not over cooked and dry and hard. ( Also I like my liver sliced thin not thick, it cooks quicker and to me tastes better.) I slice my onions thin in rounds and cook them in another pan, and just put them on top as I go to serve the liver. 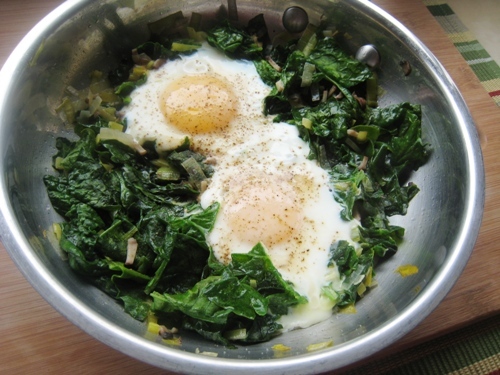 The spinach over eggs was a recipe I was given to up my blood count after the birth of my first daughter. Also cooked rice with hardboiled chopped eggs and spinach as a replacement for potatoes at a meal to improve the blood. Old remedies, worked for me. I always toss some spinach in our smoothies. If we don’t have fresh then I use TJs frozen. I use TJs frozen stuff in almost everything for my kids. I thaw it in the microwave and then sprinkle a bit inside quesadillas, pastas, etc. Recently I’ve started simply sauteing fresh spinach and using it as a simple side. Heat olive oil, saute some sliced garlic in the oil, add as much spinach at the pan can hold, put the top on the pan and let it steam for a couple of minutes. Once it is wilted I stir in some fresh lemon juice and salt. It’s pretty tasty. Sometimes we go heavy on the lemon juice. 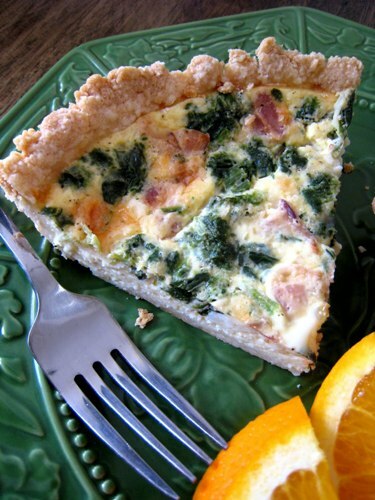 LOVE spinach AND eggs. I can’t wait to try this! I grew up with cooked spinach and eggs, but my mom always hard boiled the eggs and then fine grated them through a rotary hand cranked grater. You used salted butter…isn’t butter not Whole 30 compliant? When on the Whole 30 I use olive oil, ghee, or coconut oil instead of the butter. Isn’t clarified butter Whole30 compliant? Yes, you could use clarified butter or ghee if you’re doing Whole 30. Because it’s so expensive, I’ve used it sparingly. I made these this morning with swiss chard tops that weren’t used in a recipe and they were SOOOO good! I couldn’t believe how much I liked them. Excited for the rest of the week because I have a bunch of tops left! Thanks for sharing. Isn’t that yummy?! So glad you liked it. Thanks for letting me know!